We’ve noted a hybrid bag from Tumi before. We’re not exactly sure the T-Tech Pulse Eldridge Computer Messenger Bag breaks any new ground — who hasn’t stuffed a notebook computer in a messenger bag, with or without a sleeve? But it does seem an attractive way to carry a laptop. The Eldridge comes in a lightweight nylon and has a nice array of details, including a retractable key leash just under the front flap, a dedicated laptop-sized pocket, and a side pocket that seems appropriate for a cell phone or phone-and-organizer hybrid. Our favorite part of the bag, though, is a panel on the back that has sets of zippers at the top and bottom. 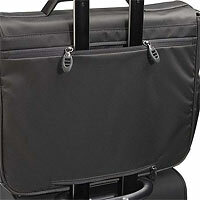 Unzip a space in the center of each and you can thread the extended handle of a wheeled bag through the panel. If you get the balance right, that’s a pretty secure way to mount a computer bag onto a carry-on. Is that a feature borrowed from messenger bags or from computer briefcases? Does it matter? We’ll take it. This entry was posted on Tuesday, June 6th, 2006 at 7:52 am	and is filed under Briefcases, Details, Laptop Bags, Man Bags, Manufacturers, Messenger Bags, Shoulder Bags, Wheeled Bags. You can follow any responses to this entry through the RSS 2.0 feed. You can leave a response, or trackback from your own site. I bought this bag on sale from a luggage store. On day one the shoulder strap came unhooked from the bag all by itself, but I hoped it was a one-off occurrence. It has happened again occasionally since, and tonight it happened with my brand-new MacBook Pro inside — which led me to the discovery that this bag has almost no padding in it either, because my brand-new Mac now has a nice big dent in the corner. 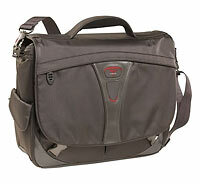 I’m not happy, and I will never buy another Tumi bag.